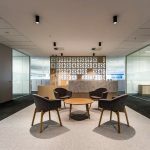 IA Design worked with the Australian Electoral Commission (AEC) to design the new state office in Tasmania, featuring a showpiece breakout area for staff to enjoy. The breakout area was designed to provide staff with a place to connect and collaborate, using a natural cliff face as the primary focal point. The cliff face and surrounding furniture and finishings have created a cave-like atmosphere, offering a distinct contrast to the permanent work areas. The space is a true showpiece, creating a bold statement and accommodating the needs of all business units. In addition to the dynamic breakout area, the IA Design team designed, documented and managed a full fit-out including reception areas, meeting rooms, multi-functional training rooms, open work stations with hot desks, enclosed offices and secure storage units. 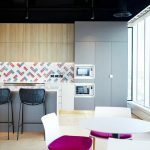 The quality outcome and level of client satisfaction with their fit-out, is testament to the robust project brief, design process and project delivery.